Virgil Scott has earned his living entertaining in Canada for over 38 years - "How many people can say that?" he says with a smile. His entertainment career began in 1968 with his neighbourhood band, "The Innocence Of Virgil Scott". His natural talent soon found recognition, Virgil was opening for major Canadian recording acts across Southern Ontario. During the same period, he spent two years in the Music Program at Humber College, as well as private vocal lessons under the mentor ship of world renowned Rosemary Burns. The resurgence of Motown and Rhythm & Blues in the 80's propelled Virgil's career, as he became a mainstay headliner at nightclubs and casinos across Canada and the United States, and to this day enjoys an extensive following. Virgil, moreover, has enjoyed an impressive theatrical career, appearing in such productions as Bye Bye Birdie, The Grinch Who Stole Christmas, and the Toronto production of Hair. 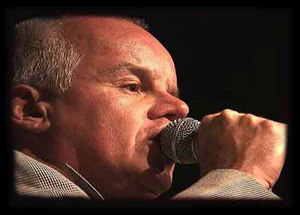 You may recognize his voice from various jingles throughout the years, such as Hostess Chips, Diamond Cheese, Molson, Labatt's, The Bay, and Sears. In addition to his musical endeavours, Virgil is also a member of the Child Find organization, and has recently received official recognition as the authorized musical spokesperson for Child Find Ontario. This is an honour he takes seriously, hosting benefit concerts throughout the province year round. The past eight years has found Virgil in the recording studio almost as much as on stage. Either with vocals on numerous CDs for other people, or producing several CD's, and was honoured to be a contributing Executive Producer on the CD "AURORA" for David Clayton Thomas. Virgil has developed several variations of his live performances. The Virgil Scott Band- A mainstay in nightclubs, corporate shows, and festivals throughout Canada. This 6 piece band is as good as it gets, delivering strong R&B with lots of soul. The Virgil Scott Motown Review - The great band always, with female singer Christina Paoletta to add Martha Reeves, and Supremes classics. Lots of Marvin Gaye and Tammy Terrell duets, Four Tops, Stevie Wonder, Temptations, this Motown show covers them all. This is a very popular corporate show, and has played the Niagara Fallsview Casino several times in the past 4 years. "LIVE" DVD available. The Duo- Traveling throughout the country Virgil utilizes his friends, working with some of the best piano players in Canada. This is a favourite of any Virgil Scott regular with the repertoire consisting of jazz standards and soft R&B tunes. From well established Bistros and restaurants to corporate functions, festivals, and as of lately becoming a popular "HOUSE CONCERT". The 3 Dads- "Its all about the voices " [MIKE BEGGS.. Mississauga News]. Musicians everywhere show up at these shows just to hear the harmonies. Beatles, Eagles, Crosby, Stills, Nash, and Young, The Band etc. Jay Speziale, Glynn Stevens and Virgil Scott join together to make a very special "Acoustic" show. The schedule for The 3 Dads is limited as Jay and Glynn are busy with several acts that hire them constantly. Their "hit men" says Virgil, two of the greatest singers in Canada and they tolerate me. Pubs, and small clubs in the GTA Mon, Tues, Wed nights "early" cause we're dads, but there is talk of some folk, roots festivals. "Live "CD available. Songs My Sister Played - is a walk down memory lane for anyone who is 45 to 65 years of age. The show takes the audience on a nostalgic journey of the 1950s and early 60s,through the reminiscences of North American culture, and influences of the time. Emphasis is on boyhood innocence, in the suburbs and the great songs of the day, 25 in all. The tone is comical, uplifting, and is intended to incite the audience to relate through the music and memories of the era. Audience involvement may include impromptu group participation, invitations to sing , twist or Hula Hoop. Yes, its just that much fun. Here are some media reviews.